John Coleman: Hang on. I know. You're doin' so good. You're doin' so good, honey. You all right? Q: Why was Kate so upset about the white roses that Esther brought her? Q: What happened in Kate's past that made both John and her therapist suspect her? Q: What is the poem inscribed on Jessica's memorial marker? Esther is one bad Mother F! We've seen Orphan many times before (The Bad Seed, The Good Son and, of course, The Omen), yet, somehow, Jaume Collet Serra manages to squeeze something fresh out of an old tale. There's plenty of shocks and also some laughs and Esther's "secret" is, surprisingly, original. 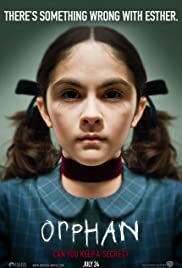 Orphan doesn't hold a candle to the aforementioned films, but its better than the more recent ones like Joshua (which, coincidentally, Vera Farmiga also starred in, as well as having the same role (mother)). Don't let the trailer fool you into thinking this is just another "evil kid" movie. Its really much more than that. This is definitely one of the better horror films to come along these days. My audience loved it, and so did I. 136 of 196 people found this review helpful. Was this review helpful to you?